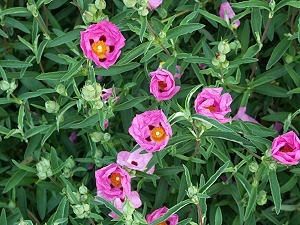 Here the Orchid Rockrose flower is just awakening for the day. Each flower will flatten out, reveal its inner markings, and then fall petal by petal gracefully to the ground with the increasing heat of the afternoon. The next morning the show will start all over again. This lasts for about 4 weeks in early spring. It blooms at the same time Kew Red Spanish Lavender does and they make wonderful garden mates as long as the Rockrose is not allowed to overtake the Lavender. 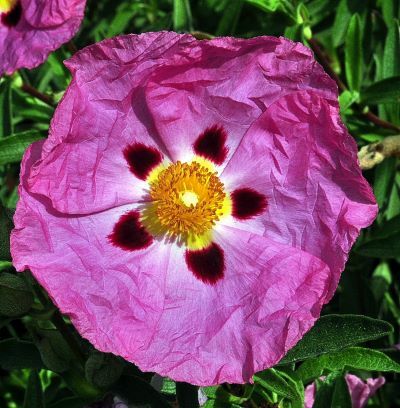 Perhaps the most beautiful of all rockroses, Orchid Rockrose spills gracefully down and out. 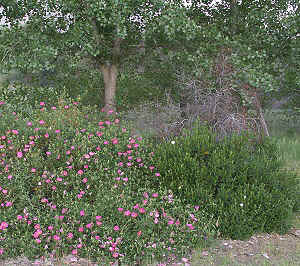 Perfect for hillsides or large open spaces, Orchid Rockrose can layer and root along its stem and spread out indefinitely.